On July 30, 2002, a 32-year-old male career Lieutenant (Victim #1) and a 20-year-old male career fire fighter (Victim #2) died while participating in a live-fire training evolution. On July 31, 2002, the U.S. Fire Administration (USFA) notified the National Institute for Occupational Safety and Health (NIOSH) of these fatalities. On September 9-12, 2002, three safety and occupational health specialists from the NIOSH Fire Fighter Fatality Investigation and Prevention Program investigated the incident. NIOSH investigators interviewed the officers and fire fighters involved in this incident, and they met with representives from the International Association of Fire Fighters and the Office of the State Fire Marshal. The NIOSH investigators reviewed the fire department's standard operating guidelines (SOGs), photographs of the incident scene, training records of the victims, reports completed by the State Fire Marshal's Office, and the death certificates. This combination departmentis comprised of 135 career and 93 volunteer fire fighters, has 12 fire stations, and serves a population of approximately 100,000 in an area of about 1,450 square miles. Training. The department requires all personnel to meet the State fire fighter requirements and have a minimum of National Fire Protection Association (NFPA) Firefighter Level I and II (480 hours) certification, and Emergency Medical Technician (EMT) I certification. The department also requires 40 hours of refresher training annually. Victim #1 had 9 years of fire-fighting experience, including 5 years as a Lieutenant. Victim #1 met the State and department requirements and had approximately 1,000 hours of fire-fighter training. Victim #2 met the State and department requirements, which he had completed on April 24, 2002. He began serving as a career fire fighter with the department on July 22, 2002, and had completed two toursa of duty with the department before the incident. Personal Protective Equipment. At the time of the incident, both of the victims were wearing their full array of personal protective clothing and equipment, consisting of turnout gear (coat and pants), helmet, Nomex ® hood, gloves, boots, and a Self-Contained Breathing Apparatus (SCBA) with a Personal Alerting Safety System (PASS) integrated into the air pack. During the NIOSH interviews, the participants reported not hearing the PASS devices sounding when the victims were found. The SCBA with integrated PASS devices were significantly damaged during the incident and were not examined by the investigators. Structure. The structure was a vacant single-family, single-story, ordinary concrete block dwelling (approximately 1,600 square feet) with a pitched-style roof with asphalt shingles (Photo 1). Several years earlier a garage or carport had been converted into a bedroom. 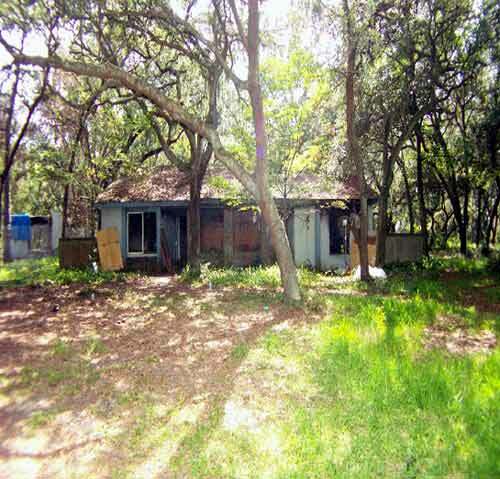 The structure contained three bedrooms, two bathrooms, a living room, and a kitchen (Figure 1). The structure had a total of 10 windows, 4 on the A-Side and 3 each on the B-Side and C-Side. 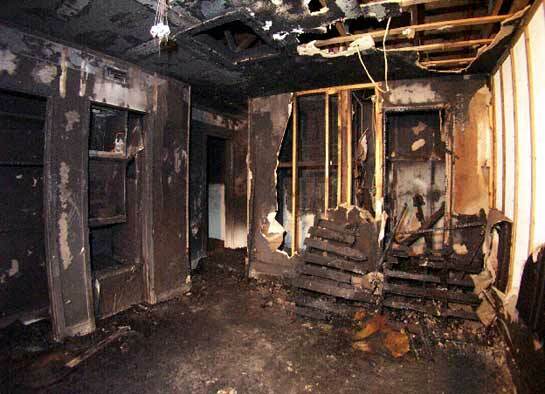 The converted bedroom, used as the burn room (approximately 24 by 15 square feet) during the live-fire training, was where the live-fire was ignited and where both victims were found (Photo 2). The floor in the burn room was covered with an indoor/outdoor-type carpeting with a urethane foam padding, and a scuttle holeb in the ceiling had been covered to prevent fire extension. According to the Office of the State Fire Marshal, several of the rooms in the structure had some furnishings (e.g., a televison set, an easy chair, a set of twin beds), and the floor was carpeted throughout the structure. Fuel. The fuel used to generate the live-fire for the training consisted of approximately five wooden pallets, a bale of straw, and a twin-size urethane foam mattress. Other fuels in the burn room included carpeting, foam urethane padding, hollow core closet doors, wood molding, wall-mounted headboards, and painted gypsum board on the walls and ceiling. Weather. The air temperature was 84 to 88 degrees Fahrenheit and the wind was calm. Weather conditions did not appear to be a factor in this incident. Fire Analysis. Upon a request from NIOSH, the National Institute of Standards and Technology (NIST) developed a fire analysis of the incident. The purpose of the fire analysis is to help demonstrate the growth and the fire's reaction when different variables are introduced. The complete fire analysis will be available for viewing on-line in the near future at http://www.fire.nist.gov. Each tour consists of working a 24-hour shift. Opening in the ceiling of the structure, fitted with removable cover for the purpose of providing access and ventilation to the cockloft or roof.